As late winter gave its final nod to the delicacies of spring and the plants in the forest around us began to put on their greenery, it seemed the perfect time to learn about the medicines that the natural world offers. 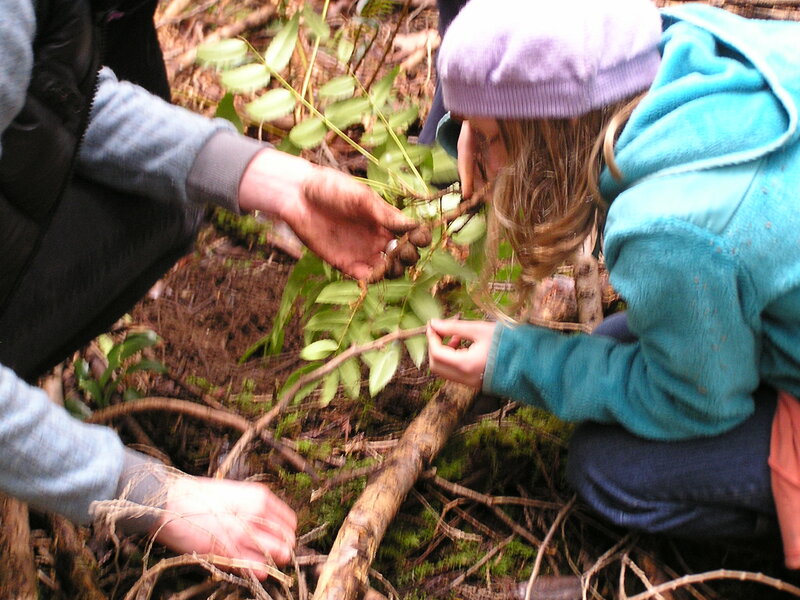 Our friend and neighbor has been studying and using herbs and wild plants for medicine for a number of years, and so another home schooling family and I asked if she would be willing to meet with us every few weeks and teach us about the qualities of wild medicines during this season, working with whatever plants are ready for collecting as the spring progresses into summer. The first plant we learned about, one that is prolific in these pacific northwest forests, is oregon grape root, or Mahonia Nervosa. 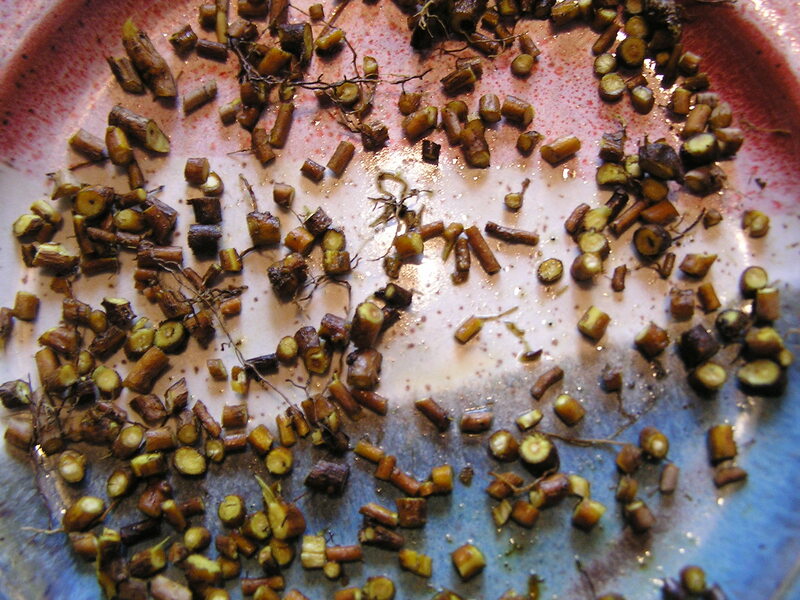 In the late winter (or in the fall) the brilliantly yellow roots of mahonia can be dug up, cleaned, chopped, and soaked in alcohol to make a very strong tincture. It didn’t take long for our four enthusiastic children to get their hands into the dirt and gently coax up the long sections of root. They cleaned it, tasted it, smelled it, chopped it, and covered it with alcohol. Each step was accompanied by many observations about how the plant affected our senses, and sometimes these sensations were different for each of us. After labeling the tincture clearly we each had a turn swishing the jar, and sending our own thoughts of love and healing into the mixture. We learned about the quality of bitter as we tasted the roots, as well as when we collected the earliest spring greens that we can eat, one of which is the common dandelion. Bitter flavours have the effect of instantly sending a message to our brains, which then send a message to our stomaches to release certain digestive juices which stimulate easier digestion. We don’t eat very much bitter food in our diets these days, and often our bodies do not get the opportunity to use this system of response. The root is also blood cleansing (minerals/ detoxifying), astringent (tightens and tones), anti bacterial, anti fungal, and anti parasitic. It expels heat type conditions, urinary tract infections and has long been used for skin disorders such as eczema and psoriases. This is largely due to the action that mahonia has on the blood system. 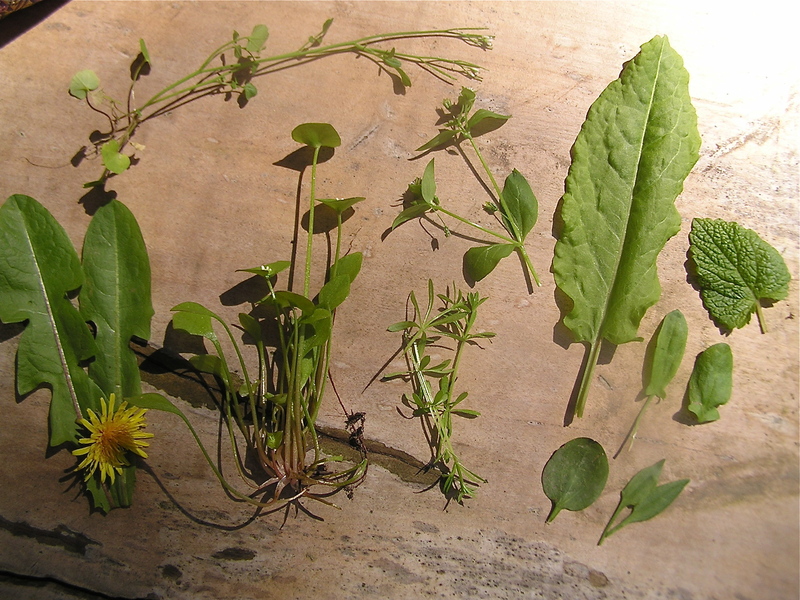 Besides dandelion leaves and flowers, we also collected chickweed, plantain, sheep sorrel and it’s garden cousin lemon sorrel, lemon balm, miners’ lettuce, peppercress, and cleavers, all of which were growing in a small area around our house and in our garden. Because of the small size of our group, we were able to engage in rather intimate conversations about our individual observations of smell, tangy or mild flavour, and dryness or juiciness. 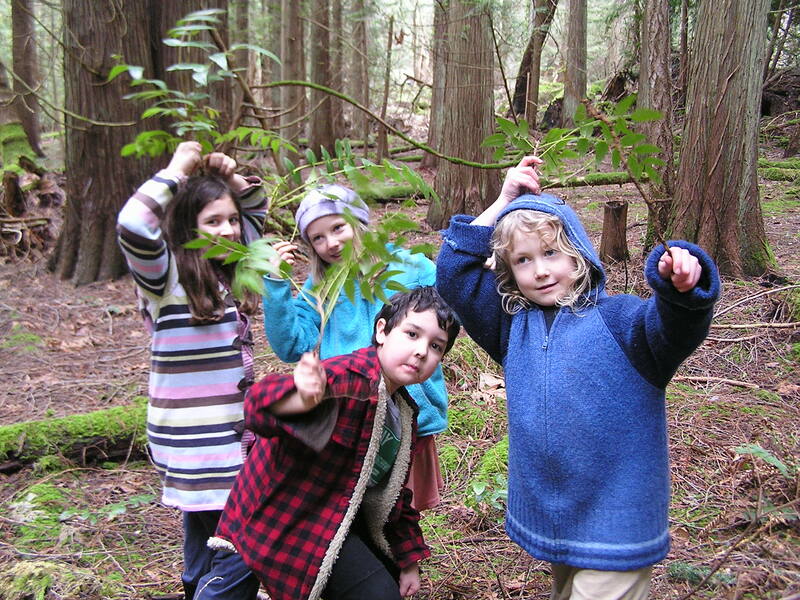 Our kids are all quite familiar with the practice of eating wild greens, and their openness to explore more options and use their intuitive senses is quite real. So is their caution, however, and on a few occasions they found look alike plants that they were able to discern as being different and so unknown in safety. We all went off in scavenger hunt fashion, to find and collect a handful of each plant. After mixing in some kale and early lettuce, and adding a light balsamic dressing, we sat and munched on an incredibly fresh and nourishing salad. Ange served up lemon balm iced tea to refresh the senses even more. 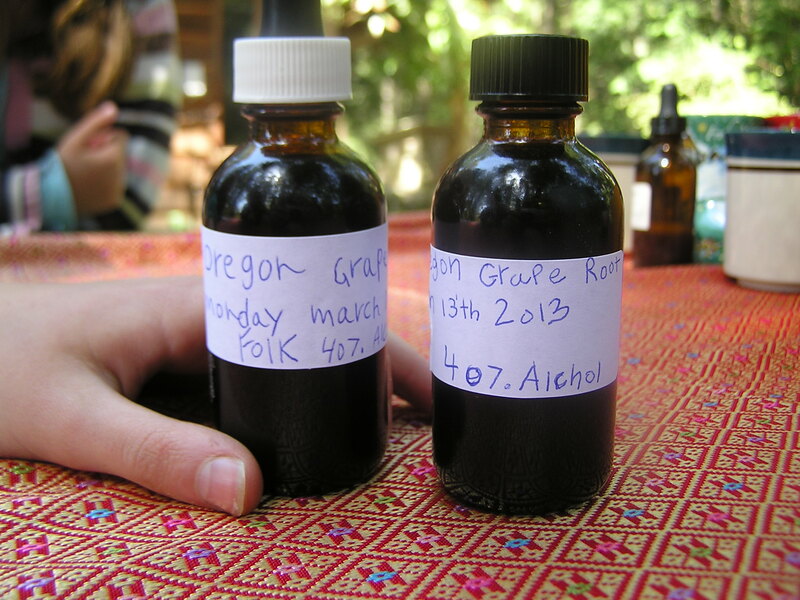 A few weeks later we met to strain out the chopped pieces of the mahonia tincture and bottle the medicinal liquid. We all found that it smelled horrible, and even tasted horrible, but it was evident that strong medicine was present. 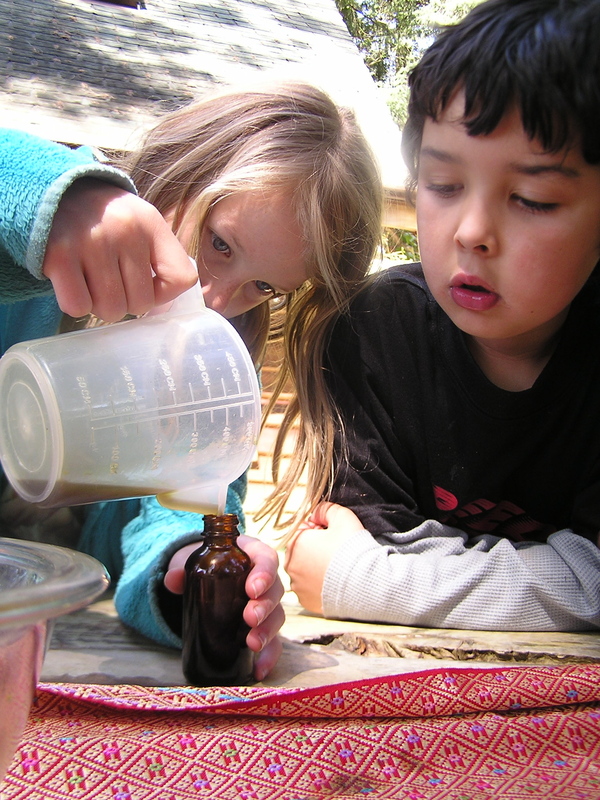 Everyone took turns in the pouring, bottling, and labeling, and we learned that to evaporate the alcohol for children, we could pour boiling water over the dosage needed and mix it with honey or licorace to sweeten it up. Then Ange turned our attention to the Douglas Fir tree that was growing right above our heads and the picnic table we were working on. We noted the needles lying flat on either side of the stem they grew on, rather than circling in a directions like other kinds of fir. At the very ends there was the lighter green flush of new needles. As each of us each chewed on a few needles, an incredible interchange of flavour and texture ensued with different observations about sensation being expressed by us all. We were going to make a fir vinegar. After clipping the new growth off the branches we could reach, the stems were plucked and the luscious needles placed into a large mason jar. Then we poured apple cider vinegar to cover it, and labeled it. Joanne took the fir needle vinegar home to let it sit until we meet again to strain it. 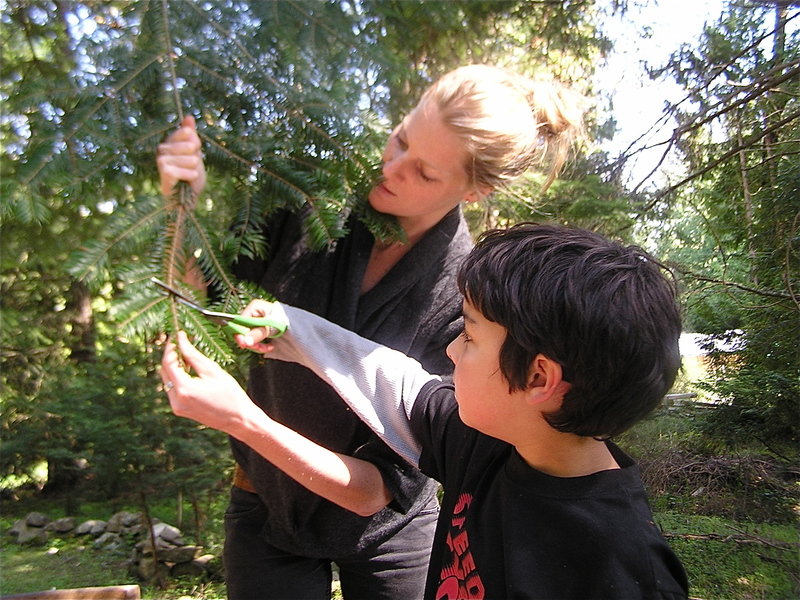 I wasn’t familiar with the idea of tree medicine, and I am so grateful to learn more. The trees hold so much for us, and I am always astounded at our forgetfulness. All of the medicines we have made follow the folk method of measurement, which means approximate amounts and intuitive reasoning. Whether adding alcohol or vinegar as the medicinal carrier, we have used just enough to completely cover the plant material without leaving too much extra liquid. 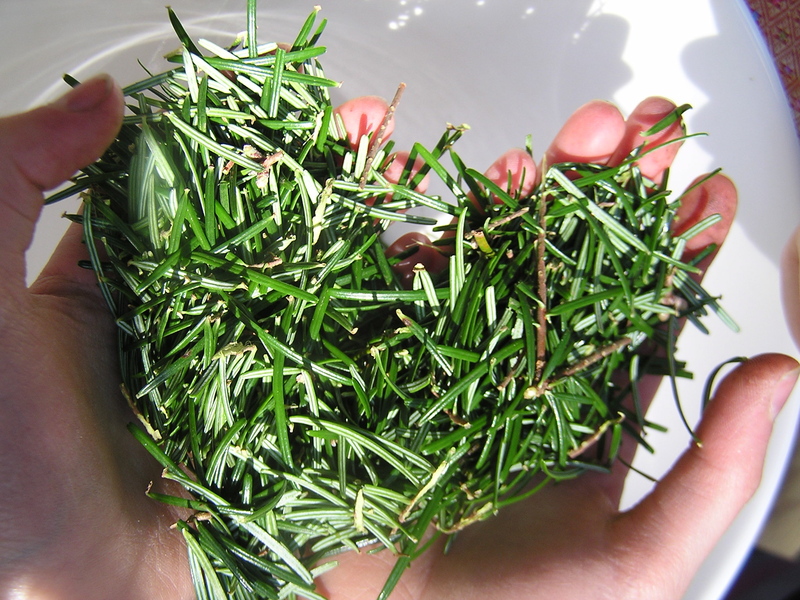 If the plant material swells a little, a bit more liquid can be added to keep it covered. The vinegar or tincture is kept in a dark place for about a month before being strained. “A plant is always much more than it’s constituents. The action or energetics of the plant can be felt through our unique sensory organs, which can be a very personal experience. 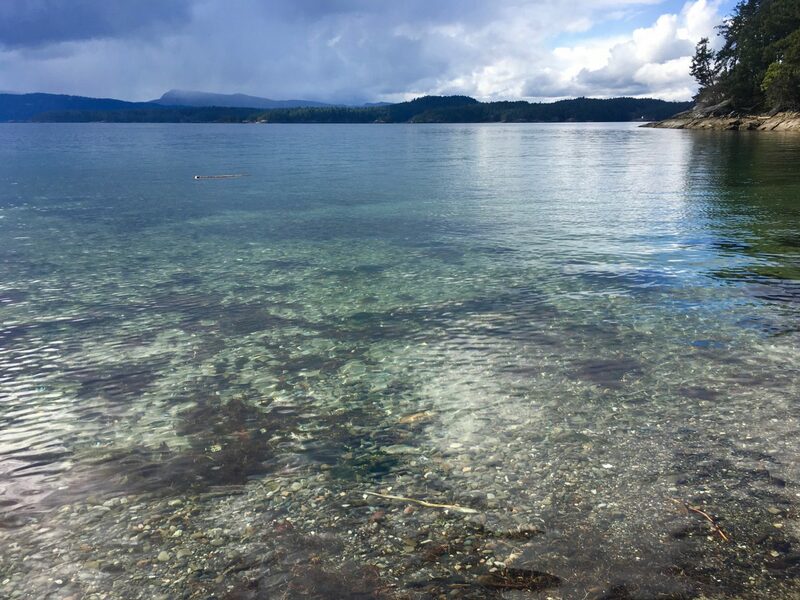 This is the foundation of herbal medicine and how we can reconnect to a beautiful wisdom.” Thanks so much to Ange for her insightful words, and the opportunities that she has brought to us through her own journey. I simply love your blog, Wendi! You have a beautiful and most definitely inspiring life! Thank-you for sharing. Thanks Virginia! Hope you are having a beautiful summer with your little family, come visit if you are ever back here.